When an active family loves water sports, they generally want to share their good times with friends. That’s where the 290 Sundeck comes in. It’s destined to be one of the most luxurious deck boats in its class. Its deep-V hull and wide “carried-forward” beam let you seat more friends in the oversized bow and huge cockpit, yet maintain a smooth, stable ride and great handling at high speed. Every component of a 290 Sundeck’s hull, from the boat’s weight and balance to its sculpted strakes, is designed for optimal tracking, handling and shock absorption—so that no power goes to waste and not a single second of enjoyment is lost. 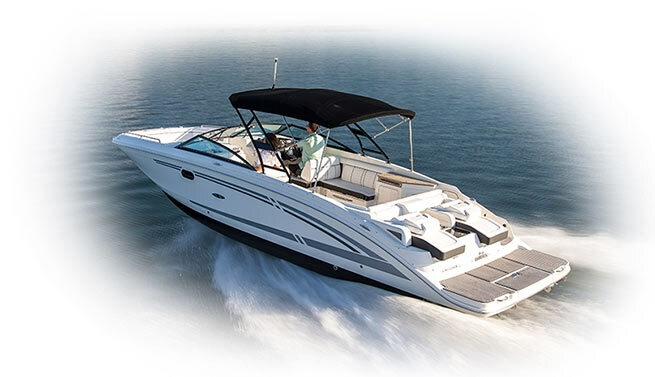 And with reliable MerCruiser power behind you, the ride quality, performance and efficiency of the 290 Sundeck is unmatched. Two loungers elevate the transom into an on-water oasis. Whether you choose to read or relax with a partner or just soak up the unobstructed views, the transom loungers provide flexibility and comfort. Keep everything you need to relax in the transom fun zone close at hand with a convenient center console and extra storage.